Surface is just like the first iPad in that it has all the flaws and rough edges you’d expect in a version one device. But it is also like the first iPad in that there is undeniably the core of something revelatory and transformative here ? a vision of the future of computing that doesn’t sacrifice either keyboard or touch. 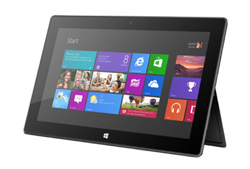 Reviewers think Surface is intended to be a tablet killer, but it isn’t. It’s a laptop killer. After living with the Surface RT for a few days now, I’m convinced that this form factor is the replacement and way forward for the stagnant laptop. I can’t even remember the last time I was this excited about a computer. The more I use it, the more I think that touch plus keyboard is the future of all laptops. How wonderful it is to flip open the Surface and quickly type a 4 paragraph email response when I need to. How wonderful it is to browse the web and touch whatever I want to. And switching between the two modes of interaction ? sometimes typing, sometimes touching ? is completely natural. Remember when I talked about two-fisted computing, referring to the mouse and keyboard working in harmony? With Surface, I found that also applies to touch. In spades. Microsoft is betting big here, probably the biggest since Windows 3.0. ?The company has been trying to have a successful phone business for years now but adoption has been less than stellar. This goes beyond using touch on the Surface devices, it extends to laptops as well. The release of Microsoft Surface RT and Windows 8 mark not simply a me-too tablet, but the marriage of old school Windows with a new touch interface and possibly marking the next step in the evolutionary scale of computing. It’s been rumored for a while that Apple would combine Mac OSX and iOS to a single operating system that would give Apple the opportunity to create MacBooks and iMacs with touch interfaces. Microsoft is the first to market with an operating system with the ability to combine the traditional laptop with a touch interface. ?Intel is getting behind this and supporting PC manufacturers such as Acer, Toshiba, Lenovo, Asus and others to produce super light devices with hybrid tablet and laptop capabilities. ?Scott Hanselman has a?great post discussing his use of an Intel Ultrabook prototype?with some follow-up in a second post and how it compares to the norm. There is real innovation going on here but will users want to combine touch and typing in a laptop format? ?I think so if the hardware is good and the UI responsive. I see the Surface, unlike the iPad which is mainly a device for consuming content, an equally good creator of content. ?I have tried many times to write a blog post or even a fairly length email on my iPad, but the process is difficult. ?The keyboard under glass doesn’t do it for me as a touch typist so my speed and accuracy pay the price. If Microsoft can continually drive innovation in the Surface and keep the PC hardware manufacturers producing really good hardware (read like Apple) they’ll have a nice 1-2 punch with their offering. ?Software developers should feel compelled to take advantage of this and create great productive applications. ?Everybody wins, but?Microsoft has to keep focused and listen to customers. I just wonder how easy it will be to accept touching my laptop screen. ?I always ask my daughter to keep her fingers off my MacBook Air screen when she’s pointing something out to me. ?Hopefully the glass on these devices will mask fingerprints well during use like the way the iPad does. ?Time will tell.